8mm box wrench and socket set Most newer 12 point 8mm wrenches are thin enough to work in these close quarters. Does not require case splitting. 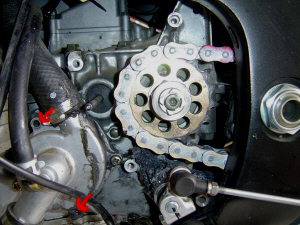 Suggest to do when replacing chain and sprockets. It's possible that some individual frames may be bent and welded very slightly differently, but we haven't seen one, yet. There is a slot on the back of the water pump shaft that has to be lined up when re-installing so look at it now. Plug the hole with a cloth or towel. Remove the 5 bolts holding on the shifter housing. 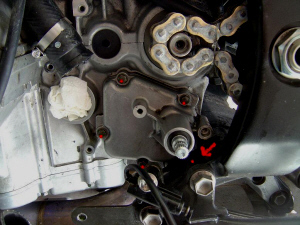 There is one bolt (red arrow) that you need a thin or offset 8mm 12 point box wrench for. 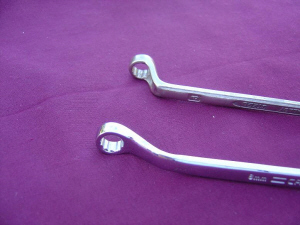 These box end wrenches would work. Sometimes 1 or 2 of the alignment dowels will stick in the cases and will prevent a screw from coming out and keep you from getting the cover out - use needle nose pliers to lift them out of the case and up the screw shaft if necessary. You have to turn the cover about 90 degrees or so as it comes off, to clear the frame. Also have to jiggle it a bit for that 1 troublesome bolt to dislodge itself. Here is a pic with the shaft still in the housing (inside view). Now that you have studied it, pull off the shaft. Remove the allen screw that holds on the star, and the 10mm headed bolt that holds on the detent arm. Remove the old star, the old detent arm and spring. Replace with the new ones from the kit. They are simple and can only go on one way. The star has a small offset hole and that lines up with a pin on the end of the shifter fork hub. 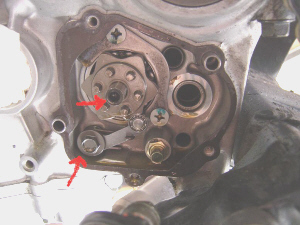 Replace gasket with new supplied gasket. 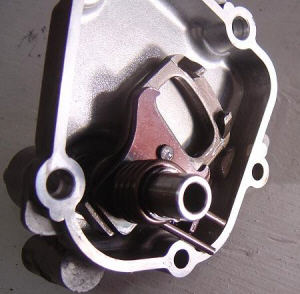 Remove the shift assembly shaft from the housing cover. Install it into the shift mechanism. Be sure to line up the oval opening of the shift arm over the pins on the star. When you assemble, make sure these spring's 2 arms go over over this gold pin - one arm of spring on each side of the pin. Slide the shifter housing back over the shifter shaft and install the 5 bolts. Check and see if it shifts nicely (put the shifter lever on temporarily) BEFORE you put the water pump and sprocket, etc back on. 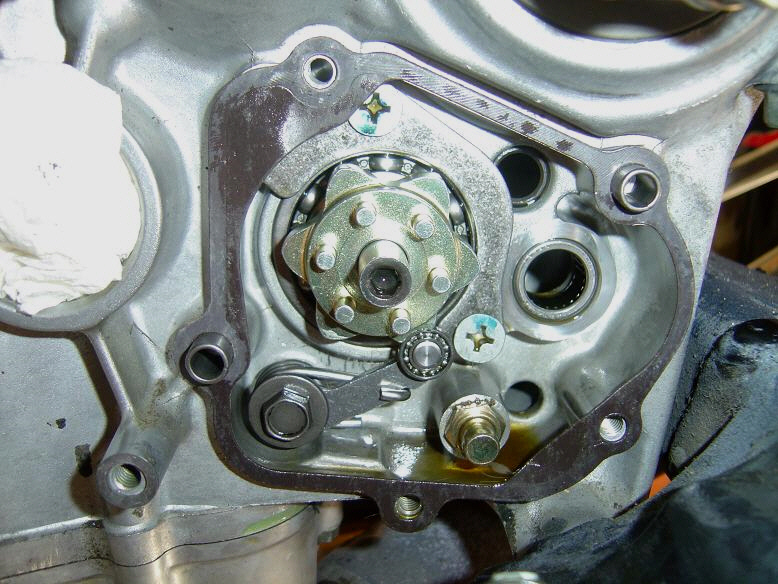 When test shifting through the gears, you MUST rotate the countershaft sprocket shaft back and forth to allow the gear dogs and slots to line up inside the gearbox. That being said, it's pretty hard to assemble wrong. Now all goes back together. TIP: Always put a dab of grease on all the oil seals or o-rings when putting them back together.